The Nature Conservancy of Canada (NCC) and Kenauk Nature have been working together since 2013 to conserve the large, historic Kenauk property. The property is located halfway between Ottawa and Montreal. This collaboration allows for accessibility and outdoor activities, while documenting the land’s natural wealth more fully and ensuring its protection over the long term. With a total area of 15,000 acres (6,000 hectares), these exceptional protected lands represent a three-kilometre-wide and 20-kilometre-long forest corridor. Kenauk is an area of unique habitat, covered in great forests and no fewer than 60 lakes! Several rare species in Quebec are found here, as well as beautiful black maple forests, an at-risk species in the province. The calcareous soil helps sustain a distinctive plant life. Several species designated under the Quebec Act Respecting Threatened or Vulnerable Species grow here. The deep Kenauk forests provide ideal habitat for large predators, such as eastern wolf, a species of special concern according to Canada’s Species at Risk Act. The presence of this species, which we are currently trying to confirm, is an important indicator of the global health of the ecosystem. 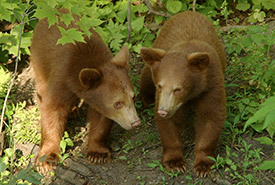 American black bears are also present, including several rare cinnamon-coloured individuals. 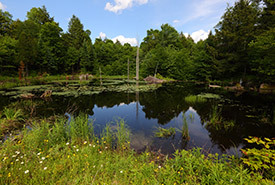 Wetlands and aquatic environments, such as streams, ponds and lakes, cover almost 15 per cent of the property. They provide suitable nesting and staging habitats for American black duck, wood duck and many other species of migratory birds. The watershed of the Kinonge River (also known as the Salmon River) has been identified as a conservation priority for maintaining wildlife species. Lake char is found in Papineau Lake at the head of the watershed. To uncover the property’s secrets, NCC conducts detailed inventories in collaboration with botanists, zoologists and ecologists. Kenauk’s greatest secrets are coming to light. To date, more than 30 rare species have been reported here! Granted as a seigniorial domain in 1674 by Louis XIV, King of France, to Monseigneur Laval, the first bishop of Quebec, the Kenauk property is deeply rooted in Canadian history. From 1801 and for the century that followed, it was owned by the Papineau family, and notably by Louis-Joseph, one of Quebec’s great 19th century political figures. The protection of the Kenauk territory is part of a large-scale initiative to conserve natural corridors in the southern Laurentians. The corridor crossing the Kenauk region extends to the north. It links Mont-Tremblant National Park to the Ottawa Valley. It will play an important role in the future, as it is predicted that climate change will result in a significant movement of wildlife species toward the north. Maintaining extensive interconnected expanses of forest represents a key strategy for adapting to these changes.